On view at the Yale University Art Gallery from June 29 through October 7, Leonardo: Discoveries from Verrocchio’s Studio investigates a virtually unknown period in the career of perhaps the most famous artist of the Italian Renaissance, Leonardo da Vinci (1452–1519). The exhibition focuses on the claim of Leonardo’s first biographers that as a boy he was apprenticed to the sculptor, painter, and goldsmith Andrea del Verrocchio (ca. 1435–1488). Verrocchio is a mysterious personality. While many of his sculptures in bronze and marble are today admired as iconic masterpieces of 15th-century Florentine art, scholars have never agreed on a list of surviving paintings that might be by him, or even whether any of them are by one artist alone. Consequently, previous attempts to determine what Leonardo might have learned from Verrocchio have rarely led to serious proposals to identify the earliest works of that revolutionary genius. 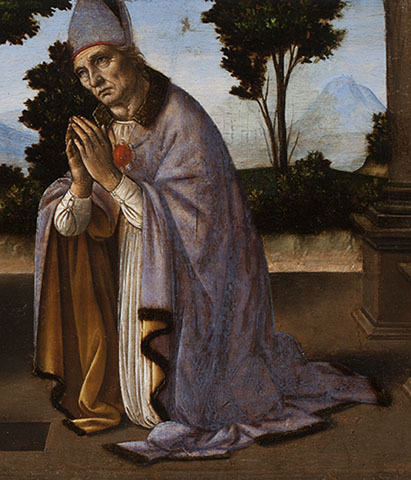 Only one fully documented altarpiece commissioned from Andrea del Verrocchio is known. Installed in the cathedral of Pistoia, near Florence, it was described in the 16th century as the work of Leonardo’s fellow pupil in Verrocchio’s shop, Lorenzo di Credi, an attribution accepted without question by most scholars. Two small paintings once part of this altarpiece—an Annunciation and a scene depicting a miracle of Saint Donatus of Arezzo—are now in the collections of the Musée du Louvre, Paris, and the Worcester Art Museum, Massachusetts, respectively. These, too, have conventionally been attributed to Lorenzo di Credi, an artist of relatively modest talents. In March of this year, a small exhibition in Worcester united the Louvre and Worcester paintings for the first time since they were separated, probably in the early 19th century. The Gallery’s exhibition follows that display with 11 additional paintings and sculptures, exploring the wider context of Verrocchio and his studio of artist-helpers. Among these studio assistants, the most remarkable by far was Leonardo da Vinci, and the exhibition at Yale argues that it was Leonardo, not his younger “classmate” Lorenzo, who should be recognized as the author of the Louvre painting as well as large parts of the Worcester panel. Another painting being shown at the Gallery may also have been conceived as a Verrocchio commission, but like the Louvre and Worcester panels, it was largely executed by Leonardo. The little-known Triumph of Aemilius Paulus from the Musée Jacquemart-André in Paris has only twice before been exhibited publicly. 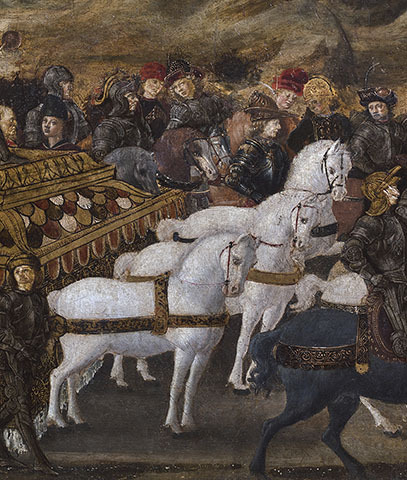 It is one of a pair of panels that functioned as fronts of cassoni: painted furniture chests commissioned for patrician weddings in Florence, this one involving the Mannelli family in or around 1473. Its companion, the Battle of Pydna—which is also preserved at the Musée Jacquemart-André and was also painted in large part by Leonardo—could not travel to New Haven but is fully discussed in the related publication Leonardo: Discoveries from Verrocchio’s Studio, Early Paintings and New Attributions, being released by the Yale University Art Gallery concurrent with the exhibition. Two other major paintings that could not travel are also identified as collaborations between Leonardo and another artist, in this case probably his teacher, Verrocchio, and are discussed at length in the book: the Virgin and Child with Two Angels in the National Gallery, London, and the Virgin with the Seated Child in the Gemäldegalerie, Staatliche Museen zu Berlin. While it springs from a renewed focus on Verrocchio as a painter and the influence he exerted on the young Leonardo, the Gallery’s exhibition also investigates the collaborative nature of sculptures produced in what must have been a large and industrious workshop. It includes three rarely studied sculptures in marble, terracotta, and stucco, each with a reasonable claim to having been made by Verrocchio and illustrating different aspects of his reliance on pupils and assistants. Comparative works by Lorenzo di Credi, Domenico Ghirlandaio, Francesco di Simone Ferrucci, Biagio d’Antonio, and Jacopo del Sellaio attest to the spread of Verrocchio’s influence throughout Florentine artistic circles at the end of the 15th century. Finally, two paintings—one of which, in a private collection, has never before been exhibited publicly—are proposed as possible early works by Verrocchio, completing the hypothetical picture of the early careers of both the master and his illustrious pupil. Kanter’s attributions rest on three main premises: that Lorenzo di Credi not only was a painter of inferior talent and intellect to his friend Leonardo but also had a distinctively recognizable style of his own; that paintings and sculptures produced in Verrocchio’s studio, as in so many Renaissance workshops, more frequently merit multiple attributions than is commonly supposed; and that Leonardo must have learned to paint in tempera before mastering his characteristic oil technique, as tempera was the medium employed by his mentor, Verrocchio. Few art historians have attempted to ascribe early works in tempera to the Renaissance polymath. “While attributing new paintings to Leonardo may be seen as an act of hubris,” states Kanter, “simply recognizing the logic behind these three premises indicates how repetitive, and at the same time uncertain, scholarship can be, even about the works of this artistic giant. Perhaps misled by unquestioned ‘truths’ or reverence for the canon, we lose sight of the fact that Leonardo, like young people of every generation, began as a student. Even genius needs to start somewhere. With patience and close looking, it is usually possible to trace the path of those first steps.” Leonardo: Discoveries from Verrocchio’s Studio invites all—scholars, art lovers, and those who are simply curious— to look closely, consider the evidence, and come to their own conclusions. This groundbreaking reexamination of the beginnings of Leonardo da Vinci’s life as an artist sug- gests new candidates for his earliest surviving work and revises our understanding of his role in the studio of his teacher, Andrea del Verrocchio. Anchoring this analysis are important yet often overlooked considerations about Verrocchio’s studio—specifically, the collaborative nature of most works that emerged from it and the probability that Leonardo must initially have learned to paint in tempera, as his teacher did. The book searches for the young artist’s hand among the tempera works from Verrocchio’s studio and proposes new criteria for judging Verrocchio’s own painting style. Several paintings are identified here as likely the work of Leonardo, and others long consid- ered works by Verrocchio or his assistant Lorenzo di Credi may now be seen as collaborations with Leonardo sometime before his departure from Florence in 1482/83. In addition to Laurence Kanter’s detailed arguments, the book features three essays presenting recent scientific analysis and imaging that support the new attributions of paintings, or parts of paintings, to Leonardo. Exhibition organized by Laurence Kanter, Chief Curator and the Lionel Goldfrank III Curator of European Art. Made possible by the Robert Lehman Foundation.